We were delighted to have a visit from Miss Margaret this afternoon, and so pleased that her enthusiasm for the portrait of her father, the President, has not diminished. Mrs. Thomas was able to see her, and we both were impressed with how beautiful she looked, in a most becoming color scheme; as you know the professional eye is ever on the alert. My object in troubling you at present, is to ask you if you could find out, who has the say so, or authority for accepting or refusing a portrait of the President for the White House? In France it is settled by the minister for fine Arts, or his department, but we have no such department here. I have been asked the modus opperandi, but have been unable to give any information on the subject. There was some momentary thought of Mr. Wilsons class at Princeton giving the portrait, but the gray seems to be in their oppinion "not sufficiently dignified for the White House." This is of course a secret that I am not suppose to tell you. But there are others who admire the picture so much that they are interested to a point where they are afraid that some other portrait, perhaps in a frock coat might be inflicted on the White House, and since they know the way you feel about this portrait, they are anxious to know what the formalities are. It is one of the best things I have ever done, & of the greatest statesman of our time, and very compelling in its dignity and power, and I myself am confident that its place is secure as a historical portrait. We know that not many other painters are going to be found to approach the subject in the same spirit, and understanding. I hope you have thought over my proposition to have it exhibited in London. There, at least, they will take the gray clothes as another expression of character and individuality, which it is impossible to get too much of in a portrait. Please present my heartiest congratulations to the President on his splendid message to Congress, which I have just read. It's great! Thomas, Stephen Seymour, 1868-1956, “S. 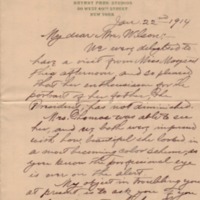 Seymour Thomas to Ellen Axson Wilson,” 1914 January 22, WWP19581, Eleanor Wilson McAdoo Collection at the University of California-Santa Barbara, Woodrow Wilson Presidential Library & Museum, Staunton, Virginia.